"Страшные сказки" продлены на 3 сезон!!! / Penny Dreadful Season 3!!! Вы здесь » Josh Hartnett Forum » Новости. News » "Страшные сказки" продлены на 3 сезон!!! / Penny Dreadful Season 3!!! Ура! «Страшные сказки» вернутся с третьим сезоном в 2016 году! Об этом сообщил президент британского канала Sky Atlantic Зей Беннет. Напомню, канал Showtime сотрудничает со Sky Atlantic в производстве сериала. Съёмки третьего сезона начнутся этой осенью, в Ирландии. Series two of Penny Dreadful has yet to finish on Sky Atlantic but that hasn't stopped the channel from ordering a third series of the gothic drama. Sky has officially confirmed that an order for new episodes of the drama – starring Billie Piper, Josh Hartnett, Timothy Dalton and Eva Green – has been put in. The British-American production follows characters based upon icons of 19th-century Irish and British fiction, including Dorian Gray from Oscar Wilde's The Picture of Dorian Gray, Mina Harker and Abraham Van Helsing from Bram Stoker's Dracula, and Victor Frankenstein and his monster from Mary Shelley's Frankenstein. Vanessa Ives (Eva Green) and Ethan Chandler (Josh Hartnett) have been forming a deeper bond in series two as the group, including Sir Malcolm (Timothy Dalton), Dr. Frankenstein (Harry Treadaway), and Sembene (Danny Sapani), unite to banish the evil forces that threaten to destroy them. Meanwhile, Dorian Gray (Reeve Carney) and the Creature (Rory Kinnear) are waging battles of their own. Fans will be delighted to hear that there's no room for even more mystical drama to unfold. NEW YORK, NY – June 16, 2015 – SHOWTIME has renewed the critically-acclaimed, BAFTA Award-winning drama series PENNY DREADFUL for a third season, it was announced today by David Nevins, President, Showtime Networks Inc. Created, written and executive produced by three-time Oscar® nominee John Logan, PENNY DREADFUL stars Josh Hartnett, Timothy Dalton and Eva Green. A co-production with Sky Atlantic, PENNY DREADFUL will once again shoot on location in Dublin, Ireland for a nine episode order to debut in 2016. The second season of PENNY DREADFUL, currently airing on Sundays at 10 p.m. ET/PT on SHOWTIME, will air its season finale on Sunday, July 5. PENNY DREADFUL’s second season has found Vanessa Ives (Eva Green) and Ethan Chandler (Josh Hartnett) forming a deeper bond as the group, including Sir Malcolm (Timothy Dalton), Dr. Frankenstein (Harry Treadaway), and Sembene (Danny Sapani), unite to banish the evil forces that threaten to destroy them. Meanwhile, Dorian Gray (Reeve Carney) and the Creature (Rory Kinnear) are all waging battles of their own. Two-time Tony® Award winner Patti LuPone appeared as a special guest star, a mysterious character of great importance in Vanessa’s past. Helen McCrory returned as Evelyn Poole, the seductive spiritualist who poses a unique threat to our protagonists, along with Simon Russell Beale, who is back as eccentric Egyptologist Ferdinand Lyle. Additional guest stars include Douglas Hodge as a Scotland Yard investigator and Sarah Greene as Poole’s powerful daughter, Hecate. PENNY DREADFUL is created, written and executive produced by John Logan (Hugo, The Aviator, Gladiator) and executive produced by Logan's Desert Wolf Productions, and by Oscar winner Sam Mendes (American Beauty, Skyfall) and Pippa Harris’ (Revolutionary Road, Call The Midwife) Neal Street Productions. A co-production with Sky Atlantic, PENNY DREADFUL is shot on location in Dublin, Ireland. For more information and video clips, please visit penny-dreadful.com. 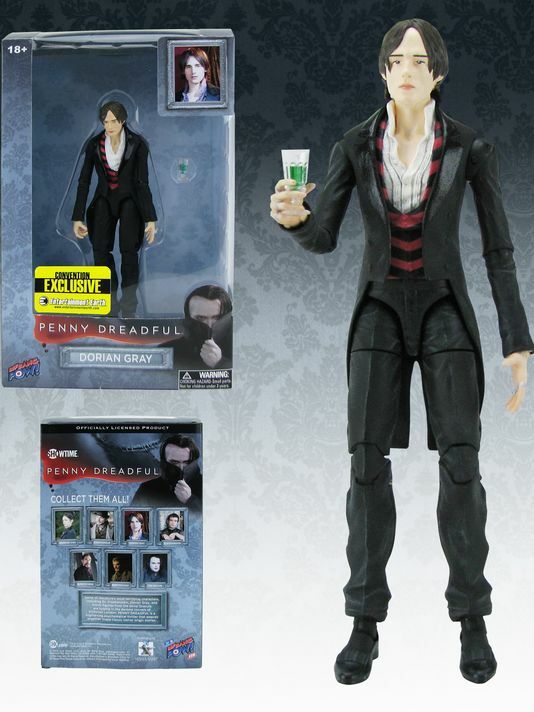 The cards say there’s more Penny Dreadful in store for us all. Showtime has renewed the gothic horror for a third season, the network announced on Tuesday. Production on the nine-episode season will begin this fall in Dublin, Ireland—also the filming location of the first two seasons—to air in 2016. Season 2 concludes on July 5. 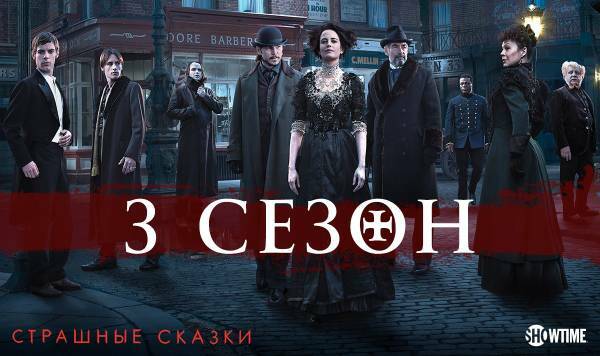 Все рады сериала на 3-й сезон! Хоррор-серіал "Страшні казки" продовжили на третій сезон. 9 нових епізодів буде продемонстровано вже у 2016 році. Радісну для всіх шанувальників проекту новину повідомив президент Showtime Девід Невінс: "Дивовижний сценарій Джона Логана і неймовірно талановитий акторський склад продовжують залучати до цього ретельно продуманого світу "Страшних казок" прихильників по всьому світу". Серіал переносить глядачів у дев'ятнадцяте століття. Головні ролі у "Страшних казках" виконують Тімоті Далтон, Єва Ґрін, Джош Хартнетт, Рорі Кіннер, Хелен МакКрорі, Біллі Пайпер та інші. Хоррор-драма вернется с третьим сезоном в 2016 году, который станет на одну серию короче, чем текущий второй, то есть, будет состоять из девяти эпизодов. "Изумительный сценарий Джона Логана и невероятно талантливый актерский состав продолжают вовлекать в этот тщательно проработанный мир "Ужасов по дешевке" страстных поклонников по всему миру, - отметил в своем заявлении президент Showtime Дэвид Невинс. – Вместе с нашими чудесными партнерами из Sky Atlantic мы с нетерпением ждем новых приключений от Джона и его команды". Съемки драмы, созданной Джоном Логаном, главные роли в которой исполняют Джош Хартнетт, Тимоти Далтон и Ева Грин, пройдут как обычно в Дублине, Ирландия. ""Ужасы по дешевке" идеально подходят для Sky Atlantic своим международным масштабом и амбициями, но с британскими актерами в своей сердцевине и съемками в Ирландии, - в свою очередь прокомментировал новость режиссер Зай Беннетт, который также является продюсером в Sky Atlantic. – Я очень рад тому, что сериал возвращается на наш канал, а также сотрудничеству с Джоном Логаном и нашими хорошими друзьями в Showtime". The series spearheaded by screenwriter John Logan will begin production in Dublin this fall. Showtime has ordered nine episodes. Season two of the period drama starring Eva Green and Josh Hartnett will wrap up on July 5. “Dreadful” is a co-production of Showtime, Sky Atlantic and Neal Street Prods., the London-based banner headed by Sam Mendes. “Dreadful” has been a multiplatform success story for Showtime, with a good portion of its audience coming through VOD and streaming platforms. Sky Atlantic has renewed the critically-acclaimed, BAFTA Award-winning drama series Penny Dreadfulfor a third season. Created, written and executive produced by three-time Oscar® nominee John Logan, Penny Dreadful stars Josh Hartnett, Timothy Dalton and Eva Green. A co-production with Showtime, the series will once again shoot on location exclusively in Dublin and Wicklow for a nine episode series to debut next year. During a visit to the set last year, The Minister for Arts, Heritage and the Gaeltacht stated that the first season alone of Penny Dreadful was worth €33 million to the Irish economy. With the second series of the gothic horror series currently airing on Sky Atlantic and third season coming next year, it is anticipated that Penny Dreadful could be worth up to €100 million for the Irish economy by the end of 2016. Penny Dreadful’s second season has found Vanessa Ives (Eva Green) and Ethan Chandler (Josh Hartnett) forming a deeper bond as the group, including Sir Malcolm (Timothy Dalton), Dr. Frankenstein (Harry Treadaway), and Sembene (Danny Sapani), unite to banish the evil forces that threaten to destroy them. Meanwhile, Dorian Gray (Reeve Carney) and the Creature (Rory Kinnear) are waging battles of their own. IFTA award-winning Cork actress Sarah Greene returns as Evelyn Poole’s (Helen McCrory) powerful daughter Hecate. Two-time Tony Award® winner Patti LuPone appears as a special guest star, a mysterious character of great importance in Vanessa’s past and Simon Russell Beale is back as eccentric Egyptologist Ferdinand Lyle. Penny Dreadful is created, written and executive produced by John Logan (Hugo, The Aviator, Gladiator) and executive produced by Logan's Desert Wolf Productions, and by Oscar winner Sam Mendes (American Beauty, Skyfall) and Pippa Harris’ (Revolutionary Road, Call The Midwife) Neal Street Productions. Пока ещё не известно, будут ли представлять актеры сериала "Страшные сказки" на Комик Кон- 2015 в Сан Диего, что состоится 8-12 июля 2015г., но фигурки для продажи уже есть! В этот раз Итан в образе Человека- Волка. Приближается главное событие года для любителей комиксов и фантастики — грандиозный фестиваль Comic Con в Сан Диего. В этом году он пройдет с 8 по 11 июля. Специально для поклонников сериала «Страшные сказки» («Penny Dreadful») компания Entertainment Earth выпустила эксклюзивные игровые фигурки героев сериала. К выпущенным в прошлом году Итану Чендлеру и Ванессе Айвз присоединились сэр Малкольм, доктор Франкенштейн со своим Созданием, Дориан и Итан в образе Волка Господня. Высота фигурок 15 см. Количество ограничено, но возможен предзаказ на сайте SDCC. А еще, в воскресенье, 11 июля у посетителей конвенции будет возможность взять автограф и сфотографироваться с Ривом Карни — Дорианом Греем в сериале. А также пятерым счастливчикам из числа поклонников сериала будет предложена возможность перевоплотиться в монстров из сериала. Специалисты-гримеры преобразят их по желанию в Создание Франкенштейна, Оборотня или Ведьму. Напомню, что в прошлом году именно на панели сериала на Комик Коне мы впервые услышали подробности 2 сезона — что главным злом станет мадам Кали. Но, похоже, что полноценной панели у сериала в этом году не будет. Пока, по крайней мере, нам ничего об этом не сообщили.